My grandmother had one of those, a Singer right? You had to operate a treadle to make it work. Later versions used electricity! A few years ago we had a break-in at our club hut during which the door was destroyed. It was only a half-glazed house door which must have been at least eighty years old, built at a time when burglaries were less common because no-one had anything worth stealing! Its lightweight construction was no match for a determined blow from an axe or sledge hammer. The man who was the treasurer at the time donated a ledge and brace door which was surplus to requirements. For reasons which need not concern us, this member has decided to cut his involvement with our club and has demanded his door back. Rather childish I thought! A local builder has contributed a steel door complete with frame but as it's taller and narrower than the other door there was a certain amount of carpentry involved to make it fit. A working party was organised over the past weekend and we also welded up and erected a mast for a solar panel while we were at it. We stopped for luch. 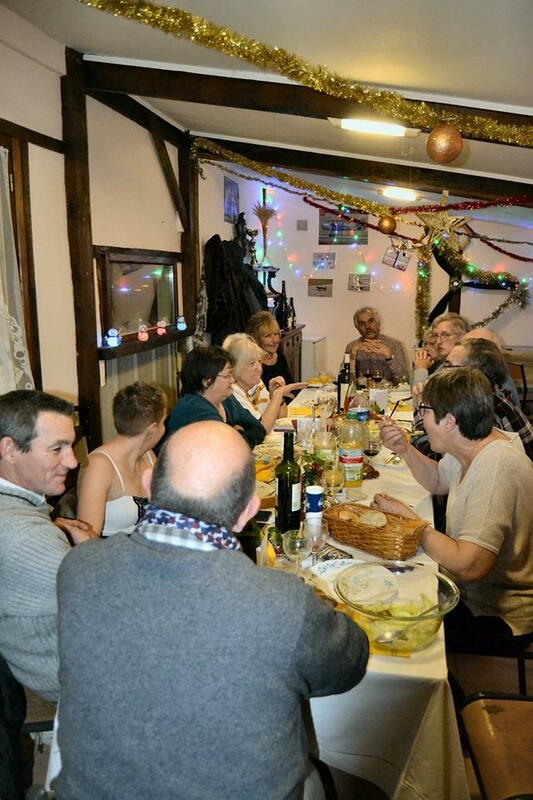 This is France so that doesn't mean a sandwich or burger with a tea or coffee, this means an aperitif, entré of cold potatoes and salted herring, ham casserole with pasta on the Saturday, omlette with sautéed potatoes on the Sunday, cheese, desert, red wine and coffee! While we were getting all of this down our necks conversation naturally flowed. 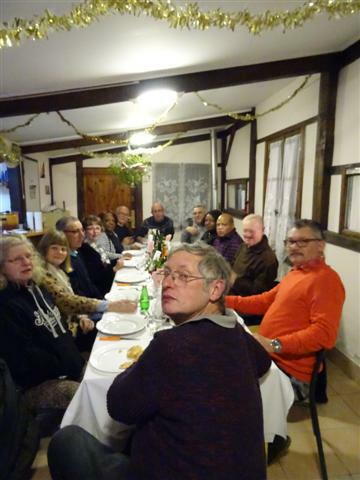 Last summer we held an open day which attracted several new members including a man who spent the Northern Hemisphere winters in South Africa. This man flies control-line models exclusively. Last year the French Government through the FFAM, the national aeromodelling organisation, forced us to register each model we own, heavier than 800 grammes or about 28 ounces. This is aimed mainly at people who want to use a drone illegally but it forces us law-abiding aeromodellers to comply. Picture of the registration number on my foamy trainer below. So we're sitting around feeling replete and mellow when the club's president announced that this man's control-line models heavier than 800 grammes will also have to be registered even though they're only capable of flying round in circles! I ask you! Have you ever heard of anything so daft? Of course if I wanted to drop a small bomb on a barracks or photograph my neighbour's teenage daughters sunbathing, I'd be sure to register the model wouldn't I? Mate i should join your club with that fare! All we get are dodgy sausage and onion on bread with a bit of dead horse (tomato sauce). We had a break in recently as well, club has security cameras and alarms, steel grates to the windows of the club building so how they managed to get in is beyond me. Some computer gear went. Odd. As for the new regulations thanks to damn drones we are about to be hit with it as well. CASA is in final consultation process and while CASA approved flying sites such as clubs run through the governing bodies such as MAAA will likely have expemtions from registration for model planes / helis it will still mean that in the future we will be heavily regulated. Drones have been kicked out of our club mainly due to their entitled attitude. We have seperate aqrea for hlip operations and they were told they had to operate thee. they got the poos and demanded to operate in the main flight line area !!! Arrogant tossers. My view is that governing bodies should not allow drone operators to join the associations, alas our body the MAAA has embraced drone racing as an FAI sport and you get shuned if you criticise it. I've had severe words and threats from our national secretary over my comments on drones. Anyway we shall see what happens. I know what you mean! I just bought 3 pair of Levi's 541 here in Oklahoma they were made in Cambodia. did they love you long time? I have 2 sewing machines. One a Singer with cabinet. Probably from 80’s in excellent shape. I last used it making covers for my covering iron. Hadn’t used it in a while so I had to read the manual. Number two is a favorite; a used Japanese JuKi industrial machine. But, I think, due to lack of use it has locked up and won’t turn. I’ve gotten as far as giving it a good cleaning. The oil in it was just horrible. Probably not changed since new. Ordered new oil. Vacuumed a lot of dirt and crud from inside. Pieces of thread soaked in oil. Still will not turn. Last step is to remove the hook and see if there is thread and dirt locking it up. Accessing the 3 screws will be a challenge. That’s why I keep postponing this task. If no fix, time to take it to a repair shop. Found a shop in a nearby city. That will be my last step. Planenutzz, just to make you envious and hungry, here are a few pictures. Sorry they're different sizes. I'm no good with computers. 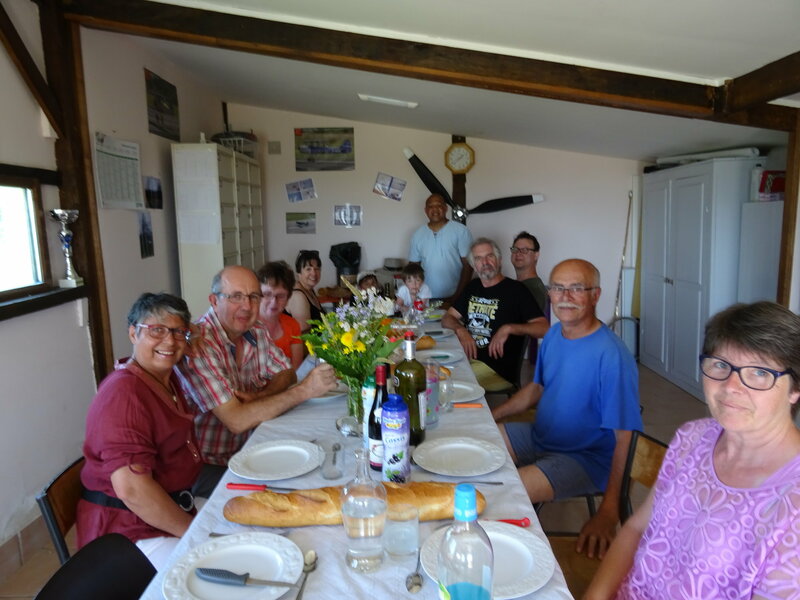 Club lunch, Glider Weekend 2018. Note the new pale blue club polo shirts. Glider Weekend 2018. Evening Meal. 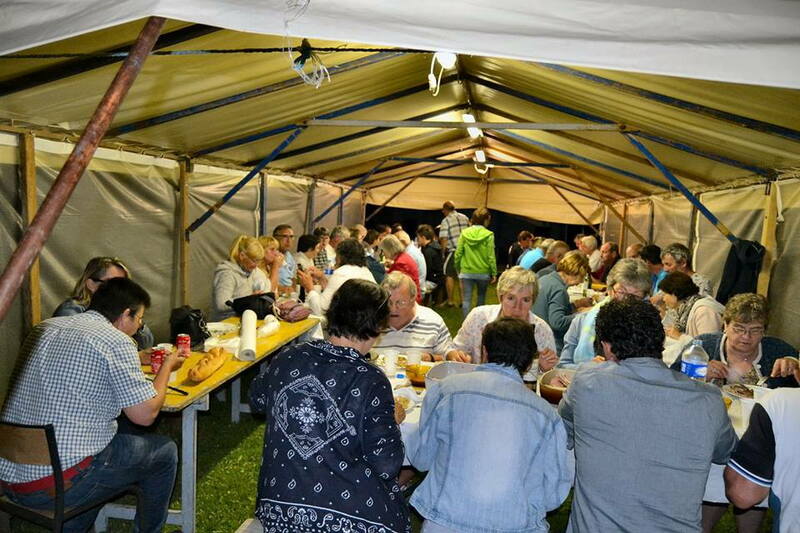 We invited the local community and made a profit on providing the meal. Last edited by Telemaster Sales UK; 03-13-2019 at 03:30 AM. You guys are making me so envious.....all that delicious looking food and drink. One thing you have to say about that French club they know how to eat! Back to the Levi's the wife likes them better then my old 505s they weigh about half as much! Mine are 501 and 502 black and blue respectively. Will be taking them over to Miss Blue Eyes tonight so that she can shorten them to match my little Welsh legs. I don't think we had sausages last New Year's Eve. I remember that we had oysters as an entrée. 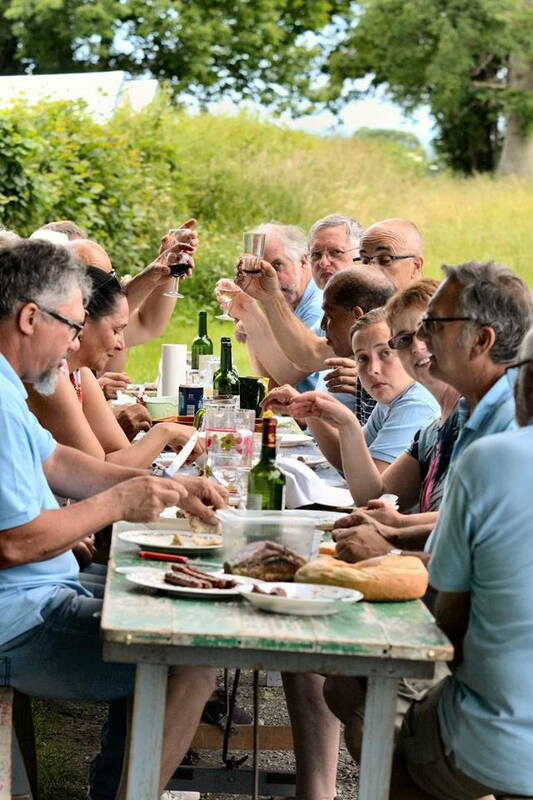 Your humble servant is seated at the foot of the table, a strategic position for the sommelier! I'm starting to think you chose your flying club for the dining! Who else is green with envy? Just to prove that we occasionally build and fly model aeroplanes at my club, did I tell you about Francois' Farman 11? His grandfather was a squadron leader with a French bomber squadron in the Great War. He was shot down and killed at the controls of his Farman 11 on 15th December 1915. 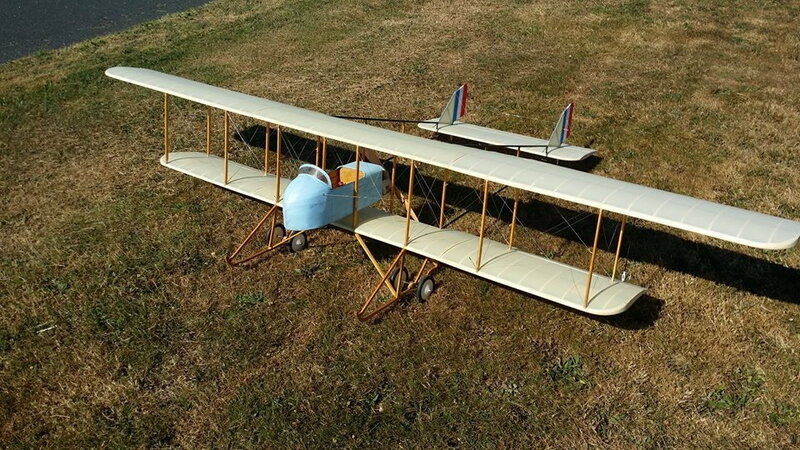 Last year Francois researched, drew up, built and flew a replica of his grandfather's aircraft, 1/6 scale I think. The real things were said to be awful flyers. After they were deemed obsolete for bombing duties they were used as trainers on the basis that if you could fly a Farman you could fly anything! The model is no better. The most I've ever seen even the club's expert manage is one left hand circuit and a landing! Aplologies if I am going over old ground. I am seventy-one you know! Hi guys, last Saturday, I ventured down to Weatherford Texas with a friend to an RC swap meet put on by a local club down there. Weatherford is about 100 miles from Wichita Falls TX where I live. I saw a lot of old airplanes go out the door that day. After the meet we ventured over to Fort Worth to JT's hobby shop and I found a brand new Rossi R40 glow engine for 50 bucks. That was quite a find for me that day and now I need to finish one of kits to put it in! I just turned 80 and have been gluing sticks together since about 1948. Unless a beginner's father or older brother was into modeling, it was difficult to get "how-to" information back then. I struggled with Comet and other kit models trying to get them to fly with no knowledge of CG, etc, etc. Later on I tried 1/2A free flight conversions of rubber models with limited success. I built a Kenhi Bobcat Ukie trainer with fox .29 and crashed it a split second after takeoff. I built my own "CW" RC transmitter and receiver from mail order parts and super regen 2-tube receiver with "sensitive relay" and rubber powered escapement in a 48" Sterling Mambo, don't ask!!. I got an ACE single channel pulse commander system with Adams actuators and began having real fun with 1/2 A RC models, mostly converted scale rubber powered designs powered by Cox engines. 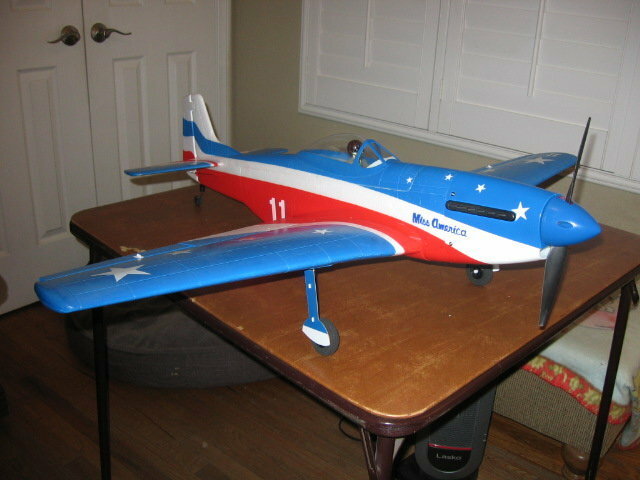 Eventually got into .40 glow powered models and 6-channel RC including a string of Mark's Models Fun Scale P-51's . I became obsessed with gull-winged Stinson Reliants and built a number of different kit versions. Used to fly at Angel's Stadium and Mile Square Park until we were kicked out. 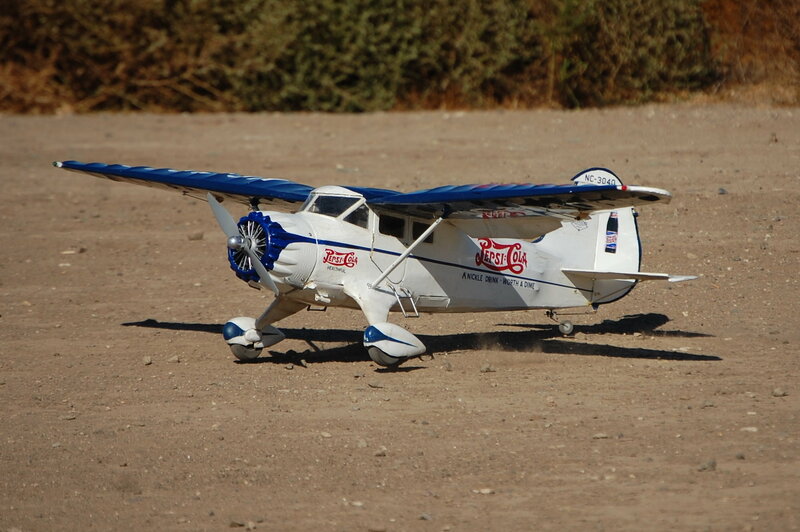 I converted to electric powered scale models so I could fly at Fairview Park in Costa Mesa. 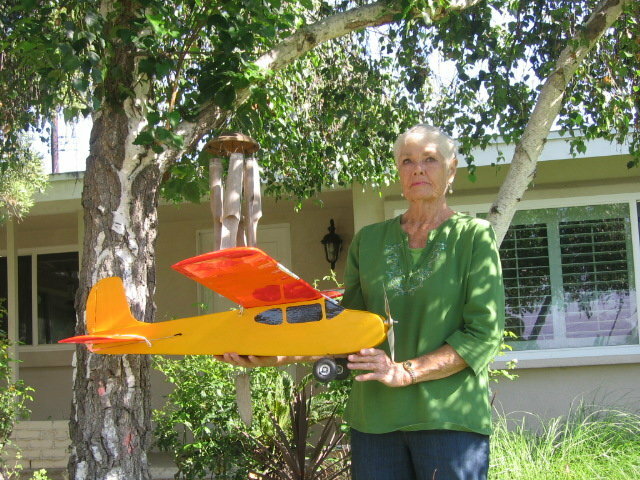 I am also a member of OCMA club that flies in Black Starr canyon, IC and electric power models are welcome there but there are strict fire prevention rules. I still enjoy building models preferring Pat Tritle designs . I also have a number of foamie ARF scale models and maidened my Tower Hobbies P-51 Miss America yesterday at the OCMA field. Also flew my Park Zone Stinson Reliant and Dynam WACO there. I have been flying a full size electric powered Sterling Mambo that I built from plans downloaded from Outerzone. The pictures below include my larger Pat Tritle Stinson Reliant kit bashed into an SR-7 version in honor of the old Comet Stinson SR-7 that I built as a 10 year old. I lived in Dallas '84 - '2000; Weatherford is the best! Hi Flicker, I thought that to the weatherford swap meet was a blast and I thought the Denton RC club swap meet was even better but I hear they are not putting it on this year due to the fact that city of Denton raised the fees for the event and wanted a piece of the Auction in form of Sales tax. Maybee another club in the area will pick it up and hold the event somewhere else. They require a city permit here! Oh bother! they are at you guys heals also! we got hit here by the tax man at one of our swap meets they went table to table making each person fill out forms to report their taxes on the sales (like that's gonna happen) Here all sales are taxed no matter the venue. the problem is getting people to report and pay. the result being events are cancelled and everyone loses. the money grab on greed prevails I can't even get a piece of paper notarized without some lawyer wanting a fee to make the paper up for me. lately I have been recovering from the flu and it is the longest recovery I have ever had, and I am still not up to Par. My hunny do's are so overwhelming i just ignore them. I wanted to go to a warbird meet but I have contractors rebuilding my road. My building and flying have really taken a back seat, little to no activity there. Last edited by donnyman; 03-23-2019 at 07:54 AM. There's a lot of illness about. My sister came back from the holiday of a lifetime holiday in Laos, Vietnam and Cambodia on 12th March and found that she'd got a severe chest infection, probably picked up from the recycled air on the airliner. She's still on medication but my brother in law was less severely affected.